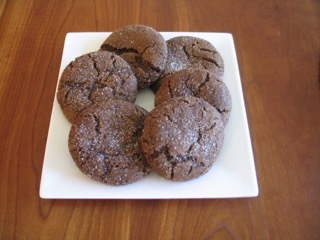 Gingersnaps are a hit around our house. Not only do they make the entire house smell amazing, but they elicit smiles all around before anyone has taken their first bite. I realized after making these cookies that there are two camps of gingersnap eaters; one that likes them hard and one that prefers them soft. How ever you like them, this recipe can be modified to give you the desired cookie texture with all the delicious taste. This recipe below is my modified version from the Woman’s Home Companion Cook Book. The cook book is owned by just about every cook in my family. It became a tradition to give it anyone who showed an interest in cooking, and it is a great resource for many recipes. My book is a 1951 version acquired from a secondhand bookstore. Measure and sift all the dry ingredients into a large bowl, and set aside. Add the butter/canola oil (you can use a combination or even use olive oil) to the sugar and blend together until smooth. Add the egg to this mixture and whip until light and fluffy. Add the molasses and vanilla, and mix together until completely blended. Combine the wet mixture with the dry ingredients in the large bowl and fold them together until completely blended. Cover the batter with a towel and set it in the refrigerator for an hour or until chilled completely and firm. Set cookies on cooling rack and let cool for a minimum of 1/2 hour. ENJOY! To make the cookies more crunchy, reduce the flour to 2 cups, add 3/4 cup of butter (instead of 2/3 cup) and 1 cup of dark sugar (instead of 3/4 cup). The rest of the ingredients remain the same. ← Where did ancient marine lizards give birth?